January 14, Port Blair: Defence Minister Nirmala Sitharaman is on a two-day visit to Andaman and Nicobar islands where she is set to witness a joint military drill involving the Army, the Air Force, the Navy and the Coast Guard. Sitharaman arrived at Port Blair on Sunday, January 13. “Sitharaman will witness three exercises general survival exercise, amphibious drill and a joint drill”, officials had previously reported, adding, “at least two drills will see participation of the three armed forces”. Andaman and Nicobar is also the armed forces' tri-service command. 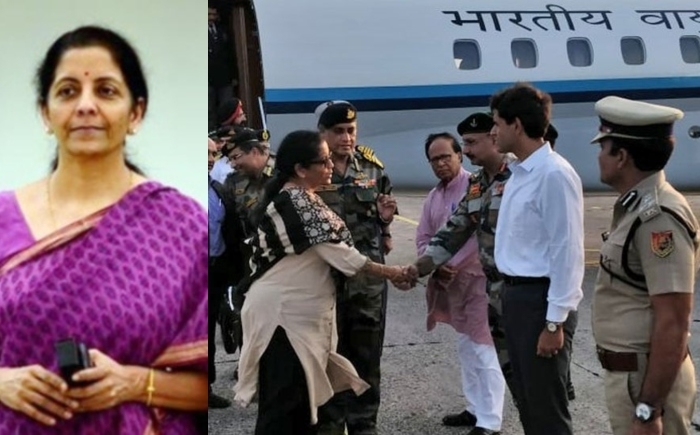 Since her arrival, Sitharaman reviewed the Command Presentation at HQ ANC and also attended a special cultural event organised by the Andaman and Nicobar Command in Port Blair, as tweeted by defence minister's official handle. The defence minister’s visit to the islands is supposed to be important as Andaman and Nicobar archipelago is straddled strategically near the mouth of the Malacca Straits. The Malacca Straits is also an important Sea Lane of Communication and used by the navies of several countries, including China which has been stepping up its military infrastructure in the Indian Ocean Region. Recently, in December 2018, Prime Minister Narendra Modi had also visited Andaman and Nicobar Islands, renamed three of the islands as a tribute to Netaji Subhash Chandra Bose during a speech at the Netaji Stadium, marking the 75th anniversary of the hoisting of the Indian flag by Bose there.